Imagine this heart-breaking scene in the Greek city-state of Sparta in the 6th century BC: a 7-year-old boy from the best of homes, loving and intelligent, was torn from his mother by authorities and transferred to an inhuman government-run institution. He was made to sleep on a thin mat, scarcely protected from the cold, and was forced to steal food to survive. His days were spent on a regimen of athletic-military and academic drills, and he was subjected to frequent beatings. What crime had the boy committed? None at all! So why did this happen to him? The child had to suffer these cruelties in order to become a full Spartan citizen with the right to vote for the Spartan king. This boy shared his fate with all other Spartan boys. Their brutal upbringing was meant to ensure they would eventually be capable of assuming responsibility for the joint affairs of Spartan society—serving not the self-interest of their family and clan, but the interests of the state. With the radical decision to pursue equality of hardship, the suppression of private riches and the drastic cutting back of the familiar in favor of public life, Sparta managed to maintain itself for an amazingly long time, for more than 500 years, immunizing itself against decline. In any system, whether it’s totalitarian-led or democratic, the private—the social warmth of one’s own family, with its striving for happiness and the success of its members—is in some degree in conflict with the state. Lycurgus—the legendary lawgiver of the Spartan “Democracy” or “Egalité”—saw this conflict, and the surmounting of it, as necessary. “That city is well fortified which has a wall of men instead of brick,” he said, his words immortalized in many parliaments, including in the U.S. House of Representatives. In any system, whether it’s totalitarian-led or democratic, the private—the social warmth of one’s own family, with its striving for happiness and the success of its members—is in some degree in conflict with the state. Sparta is just one example of the eternal conflict between family well-being, private associations, and the common weal. The central questions are: How do societies endure this conflict and what solutions do they use to shape it? Are those solutions totalitarian, authoritarian, and elitist or anti-elitist, liberal, and democratic? Modern history demonstrates various responses to the questions, many quite dangerous. For example, the fascism of the past century emulated the regimen of the Spartans but gave the purpose a dark new interpretation: underlings in uniform were to be trained not in the path to becoming voting citizens, but in unquestioning compliance. Early communist movements also worked on these problems. Armed with the theories of Karl Marx and Sigmund Freud, communists aimed to conquer the nuclear family, claimed that monogamous relationships between man and wife were outmoded, and strived for the raising of children in large collective groups. Alternate approaches to this struggle between the societal-state collective and the private sphere are apparent in the military training at America’s West Point, the armed voting citizens of Switzerland, the cloisters of the Middle Ages and the state-run, all-day schools in today’s France. Such stories are, of course, about subjects bigger than family and democracy—they are about early man’s attempts to civilize himself. And that observation from the past begs bigger questions about the future. Is the time of social-utopian large-scale experiments and extensive population discipline projects really over, and unlikely to return? Have we—the supposedly enlightened, and educated with historical teachings—finally understood how to overcome the conflict in the goals between the natural family, personal freedom and the democratic state? There are many answers to that question, including that we are still struggling with it. My own life (as a member of a large German family) and work (as a campaigner for democracy in my country and around the world) suggest to me that there is a solution that reconciles the desire for democratic organization with the personal striving for happiness. That answer: the development of a well-thought-out path to direct and deliberate democracy that supplements and modernizes our representative democratic approach. Have we—the supposedly enlightened, and educated with historical teachings—finally understood how to overcome the conflict in the goals between the natural family, personal freedom, and the democratic state? More precisely, we have to develop our democracy further into a self-learning democracy. This is a democracy that does not take place just during elections, but becomes parts of our daily lives and our communities. In this way each individual citizen is empowered. The aim here is to create a societal field that equally integrates young and old, poor and rich, uneducated and educated. What this means is that at the same time that a person is wrestling for good individual solutions for social care, for the right amount of state investment and private economic involvement, he or she is also setting personal limits and developing civic maturity. The formula proposed here is simply called “learning by doing.” The school of life then also becomes a political school of life. Is mine a naive faith in the democratic process? Are we just delaying the reckoning with the enormous problems of our democratic model? In Germany we are trying to expand the opportunities for democratic involvement to include more deliberation and more direct democracy. This approach requires an openness to engaging with proponents of the new populist right about better democratic processes, rather than rejecting them out of hand. (I see an opportunity to work with the new German right-wing populist party to achieve its stated goal of a Swiss-style democratic system for Germany). In periods of conflict, society needs to create deliberative spaces to discuss the rules of the democratic game. In this moment, such space would allow us to hear the voices of everyone, and give us a chance to slow down the drastic political fights over economic globalization, immigration, and whether “corrupt” elites” or “decent” common people are a greater threat. (A well-designed deliberative process can resolve thorny conflicts, as we saw recently during a dispute over a huge train project in Stuttgart.) Our political discourse must be balanced, like a fulcrum, if we are to re-establish stability and security. Let’s think back to our little Spartan boy. He most certainly did not want to leave his mother, his family. He was just one victim-solider among millions, who, in the name of a great social experiment, was made to sacrifice his own comfort and well being for a larger ideal. Even ex post we are not able to make it sound better. It’s more intelligent and more humane—and also urgently necessary —that we drill our democracy and send it to boot camp, rather than our children. Daniel Schily is executive manager and a co-founder of Democracy International e.V. in Germany. He has dedicated his life to fighting for direct democracy and citizen participation. This essay is part of a Zócalo Inquiry, Are Families Bad For Democracy? 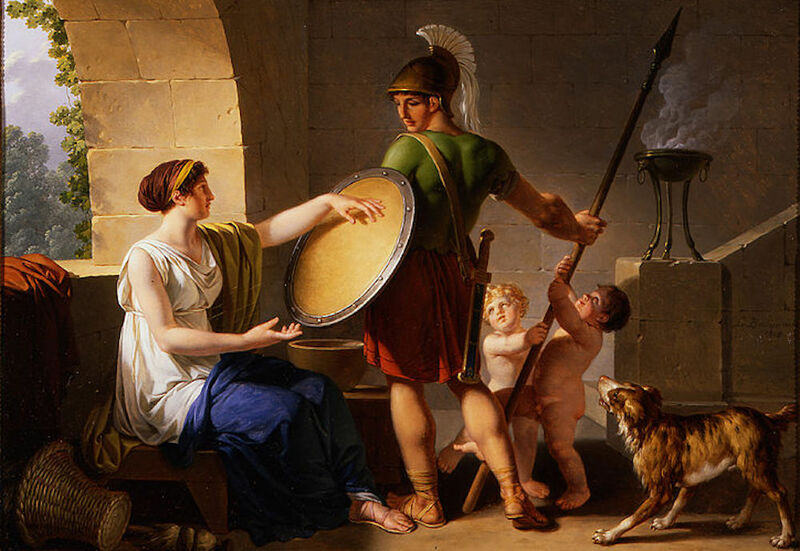 *Image: Jean Jacques François Lebarbier, A Spartan Woman Giving a Shield to Her Son, 1805, oil on panel. Courtesy Wikimedia Commons.